Hello and welcome to our Crochet Along Gallery! This Crochet Along was started by Svetlana on Crochetville.org, please enjoy our work and if you feel like adding this wonderful peace of clothing to your wardrobe, grab a button and just jump in! 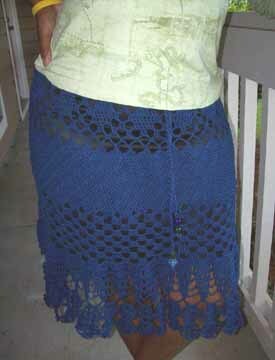 Vera said :"I love how the skirt turned out! I stopped at D5, and she needs pressing. If you look closely, you can see that I added beads to the drawstring which is a crocheted chain with three strands of cotton. I used 8 1/2 balls of DMC Senso 100% Cotton in med navy blue. ". Crochet hook:Clover Soft Touch Hook, size E (3.5mm). Yarn: DMC Senso 100% Cotton in med navy blue. upload it onto your web server (or upload it onto any photo hosting service that can manage flash objects). you're done! Well, in fact, you can also just skip the first steps and just copy/past the code in step 3! Want to see what it looks like ?